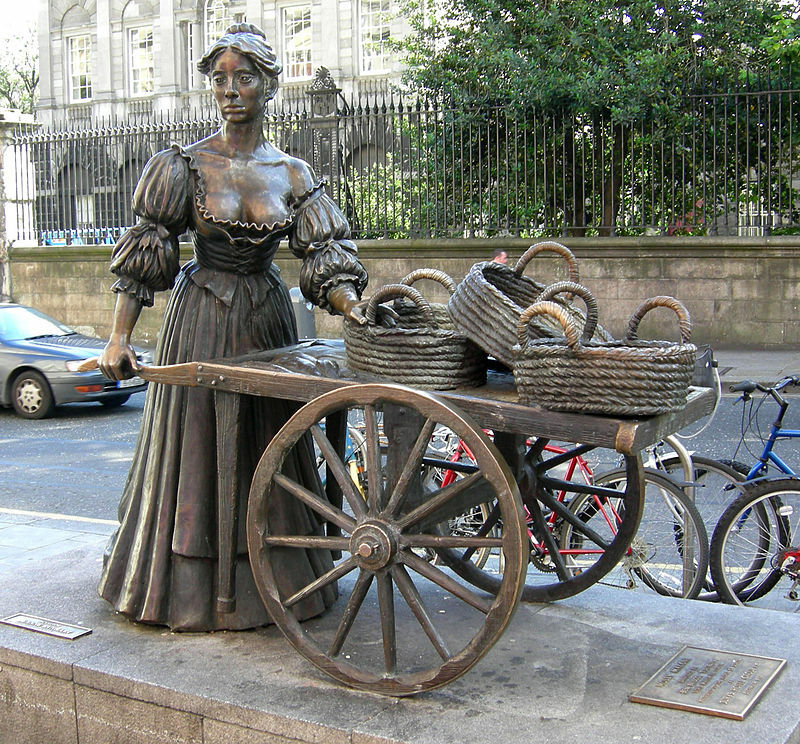 The popular Irish song, Molly Malone tells the story of the fictional tale of a young girl whom is a fishmonger. She pushes her cart throughout the streets of Dublin, plying her trade. Sadly, she dies at a young age of a fever. No one knows for sure if this song is based on a real person. Throughout the latter part of the 20th Century, legend grew that there was a historical Molly, who lived in the 17th Century. Some researchers have searched for a Molly Malone in historical records, including checking for a Mary Malone and Margaret Malone, since Molly is often a nickname for these names. However, no evidence has been found that the song is based on a real woman of any time period. In 1988, the city of Dublin declared June 13 as Molly Malone Day. The town unveiled the statue they had commissioned of Molly Malone pushing her cart. Controversy surrounded the low cut of her shirt, which was standard wear for a woman in the 17th Century. 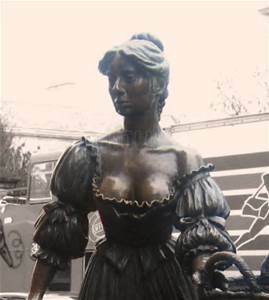 The statue is affectionately referred to by the locals as “The Tart with the Cart.” Some controversy surrounded the statue for a while and the belief of some that Molly was a prostitute by night. However, most locals seem to have embraced Molly. In 2003, the Dublin City Council sponsored a Dublin on Ice Show in which an ice statue was replicated of the popular “Tart with the Cart” statue. The song is first known to have been recorded in 1883. It was written and composed by James Yorkston of Edinburgh, and the music arranged by Edmund Forman. The ballad is first known to be published by Francis Brothers and Day in Cambridge, MA in 1884. Some historians believe the song was influenced by earlier Irish folk songs, but no evidence of this has been found. The song is often grouped with other Irish ballads but has tones of a music hall resonance. A music hall resonance refers to the British theatrical entertainment of the late 19th and early 20th centuries in Britain. It involves a mixture of popular songs, comedy, specialty acts and variety entertainment. The term is similar to the American vaudeville and burlesque styles. Regardless of her origins, Molly Malone is an Irish favorite that will keep us intrigued and discussing her story, origins and legend for years to come.